Today’s guest post is from Fay Moore, of the Blog (Fay Moore: I Want To Be a Writer). I met Fay a few years ago when she came to one of my publishing Workshops or Seminar. I remember our meeting specifically because it was pour more than cats and dogs that night, which kept a lot of people home. But Fay fought the elements to drive down route 81 from Williamsport, Maryland, to learn about publishing. Her enthusiasm is contagious and her drive to make this dream of being a writer is constant. It took a bit of time to find a meeting place. I had a list of 25 names. I had no idea how many would actually show up. Rose Harris, owner of a local coffee-house in historic Williamsport, MD, was willing to let the group use her back room free of charge two times per month. The local library also had a meeting room, but it was in high demand. The writers group may have to compete for meeting dates. That was no good. Plus, the library felt sterile. The vibe at the Desert Rose Cafe was nurturing, creative, friendly. As an added bonus, ”the eats” were good and inexpensive. 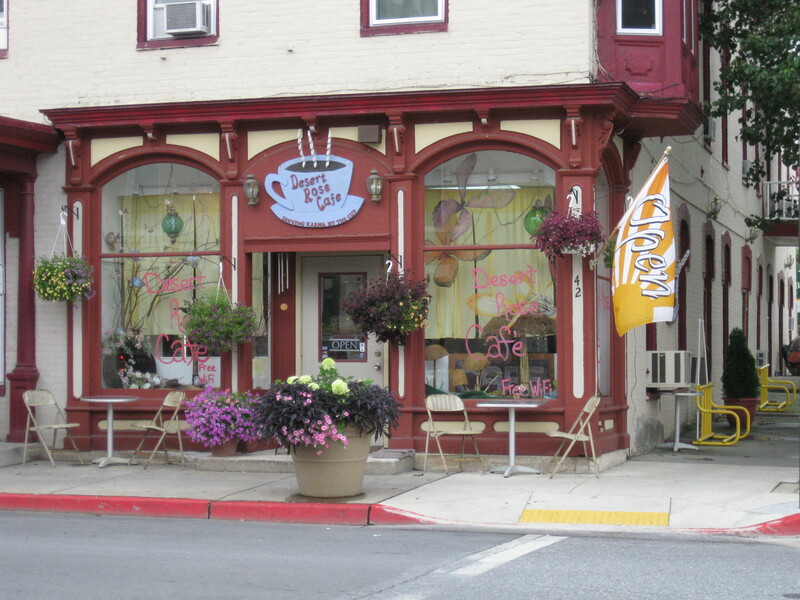 The Desert Rose Cafe in Williamsport, is the meeting place for Fay and the authors of their recent release.